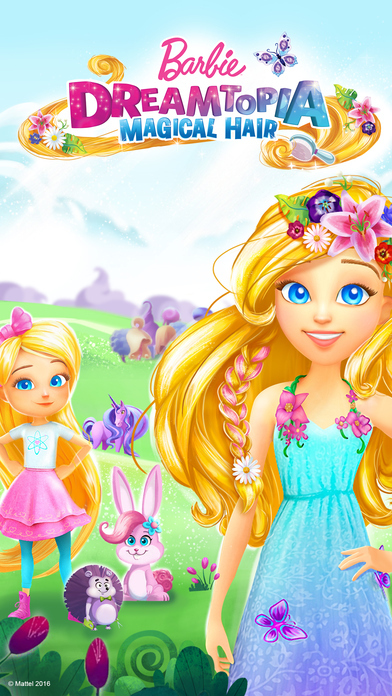 Barbie Dreamtopia is a new magical, make-believe world imagined by Chelsea, Barbie's youngest sister. 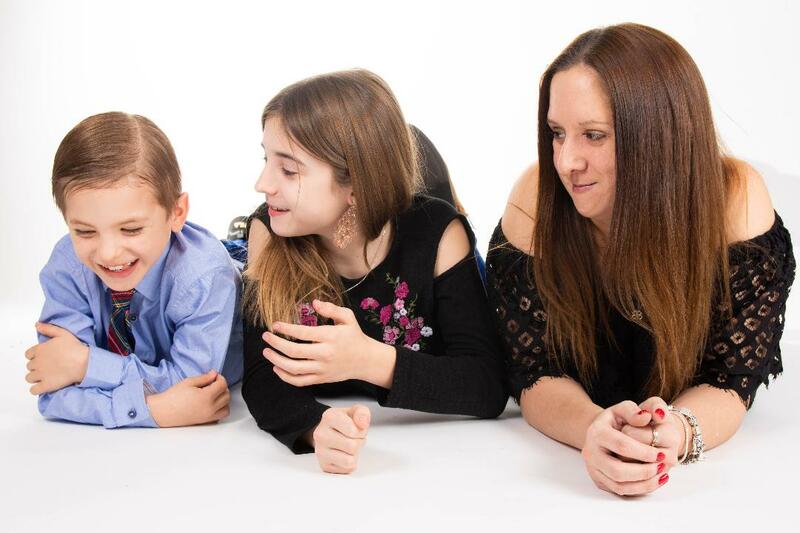 You can join Chelsea and her puppy Honey as they swim through rainbow rivers with beautiful mermaids and fly through cotton candy clouds with fairies. 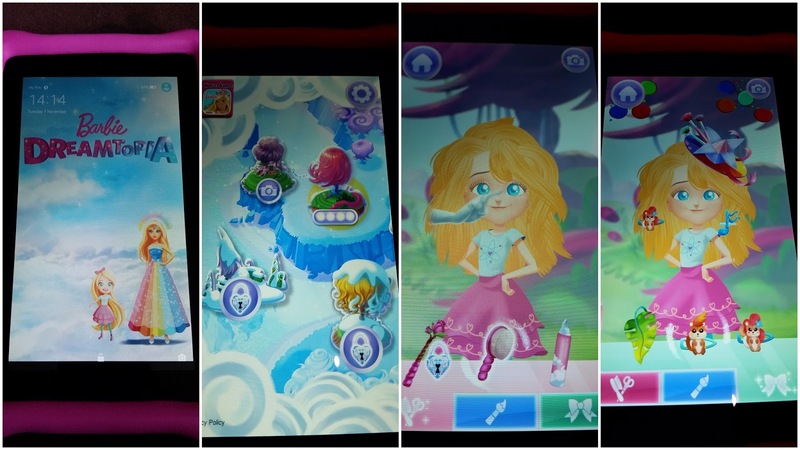 The world of Dreamtopia includes brand new toys from Mattel and an app for girls to enjoy. 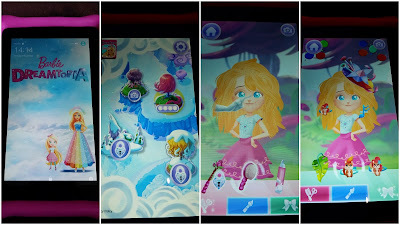 We've been playing with some of the toys available as well as the app: Barbie Dreamtopia Magical Hair. 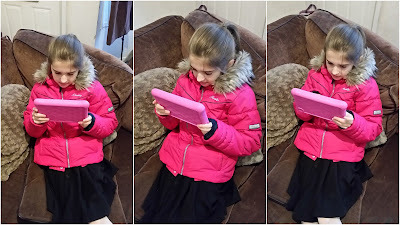 My Barbie fan, Lily has been on the case and here's what she thought. 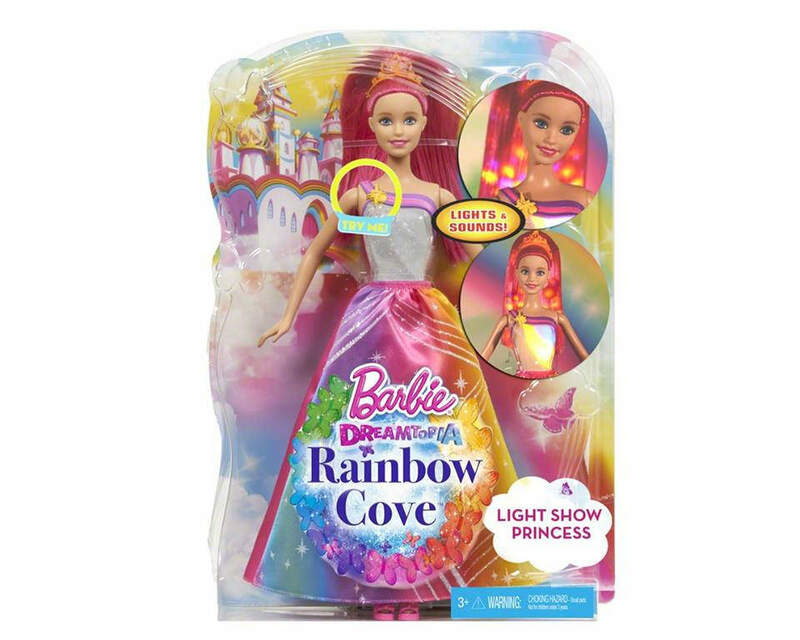 The Barbie Rainbow Cove Light Show Princess is very pretty in her rainbow coloured dress. She plays several musical sounds and lights up when you push the gem on her shoulder. 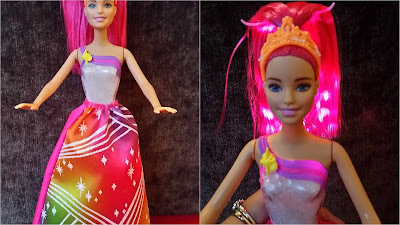 The lights shine out of her dress and a jewel on her back which reflect up onto her ponytail making that light up too. The light shows are lovely, Lily loves pressing the button over and over just to watch them. They're quite mesmerising. 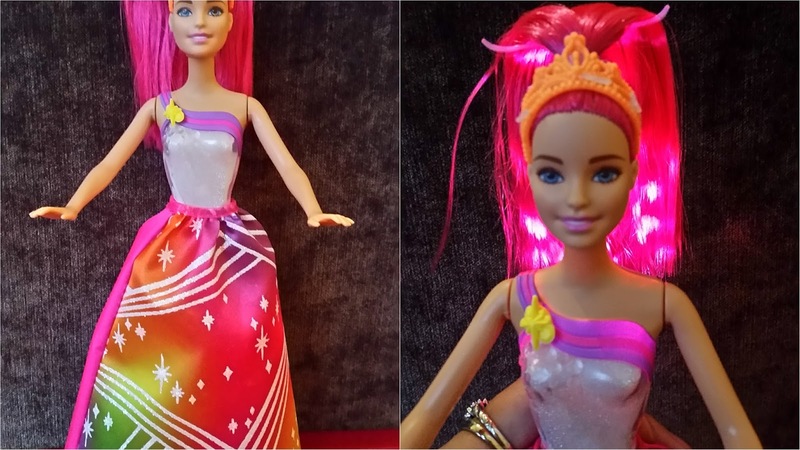 Playing with Barbie has never been so much fun as Lily loves twirling her around as she lights up and glows. She imagines her at the ball or a party on the dance floor, twirling the night away which is lovely to watch. She's priced at around £19.99 and recommended for children aged 3 and over. Lily is 9 and loves her Barbie dolls. We have quite the collection here now but Lily loves them all. There's only one thing Lily loves more than her Barbie dolls and that's awesome Barbie accessories and Unicorns so this next toy was right up Lily's street. She loved it! The Barbie Dreamtopia Horse and Carriage is just stunning, it's every little girls dream come true. The beautiful horse has a magical unicorn horn making it look just like a real unicorn. Lily was in love with this from the moment it arrived, she was so excited as she'd always wanted a beautiful horse and carriage. Everything is super bright and very pretty in rainbow colours. Lily loves the pretty pinks and purples, they're all her favourite colours. 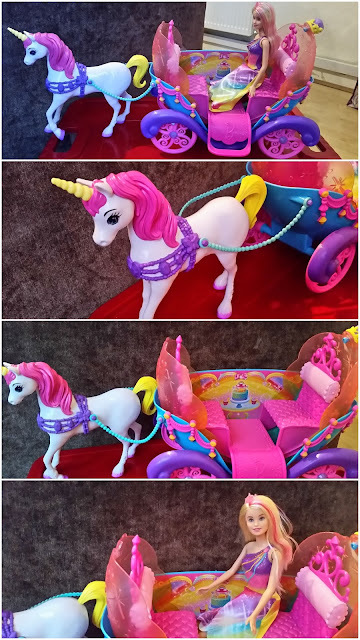 The horse and carriage make their play time adventures even more fun as now Chelsea gets to ride through a kingdom of rainbows in her colourful carriage with gorgeous unicorn! 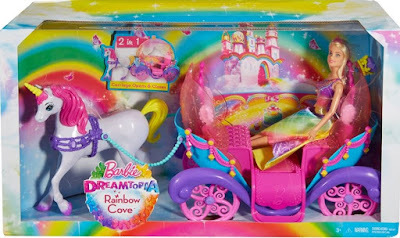 The open-air carriage comes decorated with rainbow colours and even has room for two. It has fully rolling wheels and a pretty dome that can be opened or closed to play two ways. You can attach the unicorn using the decorated purple bridle and blue beaded reins to head off on an adventure. There's so much fun to be had with this duo, the stories are endless. 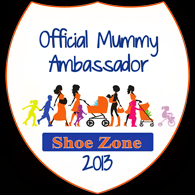 It's priced around £44.99 and again aimed at children aged 3 and over. Lily really loves the horse and carriage set, she's forever pushing it up and down the hallway in her own little world. This is definatley the kind of toy I would have loved when I was a little girl. The Barbie Dreamtopia Magical Hair App is designed for both iPhone and iPad. Inside the app you join Barbie and her younger sister Chelsea as they welcome you to Endless Hair Kingdom. It's an app for decorating hair with little accessories and pictures. The app itself is free to download but you only get access to one character (doll) and one bundle of hair accessories so play can get a little boring quite quickly. There are lots of In App purchases available to top up what accessories you have and give you access to different dolls and themes but they will all cost you money. They start from £2.99 and go upwards to £7.99. Lily liked the game and did enjoy decorating Chelsea's hair but she did ask me to buy her 'more' items a few times which sadly I didn't do. Although it's a fun idea, I'm not sure it's something that Lily would play with over and over without the extras that I'd have to pay for. Maybe if there was more to do for free then Lily would go back to it to play again. 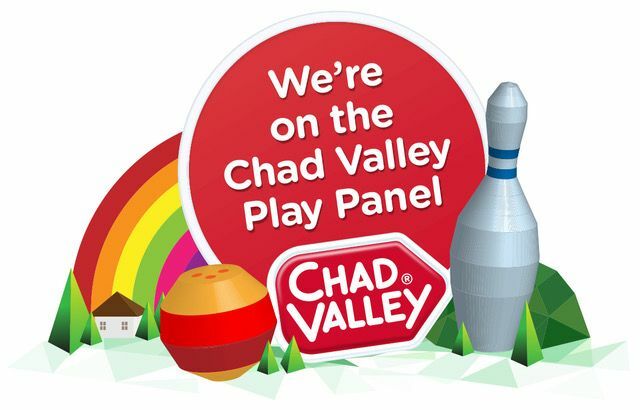 I'm sure she will play with it but maybe just not as much as she would with some of her other games that do have more options to use without having to actually spend money to do so. The games itself is very easy to play and well laid out. The pictures and characters are pretty and brightly coloured and very eye catching just like the dolls are which is all good. 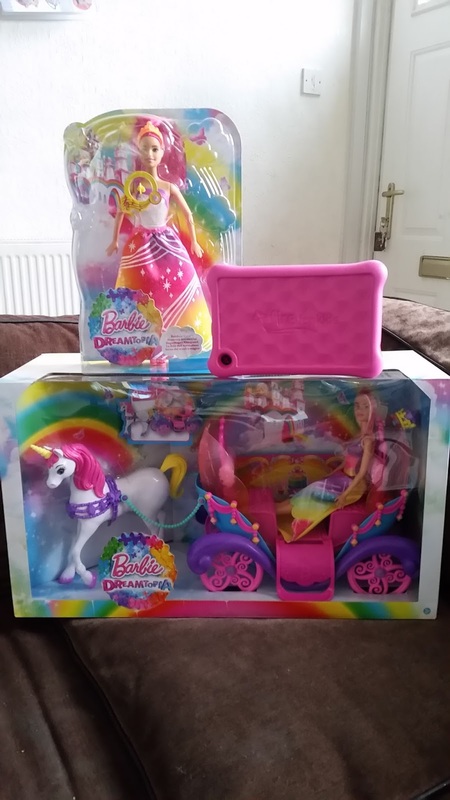 Together with the app, the Barbie Dreamtopia dolls and horse and carriage have really made Lily one happy little girl. Her imagination has been running wild over these past few weeks and she's been enjoying making up her own stories through playing with them all. If Lily hadn't had received these now she would have put them on her Christmas List as these are definatley her kind of toys. She's a dreamer who loves a hint of magic. For fun, games or info on Barbie Dreamtopia head to www.barbie.com/dreamtopia. 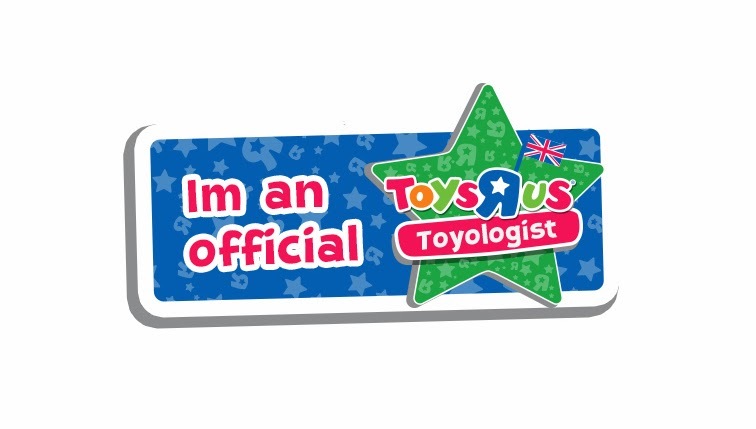 Disclosure: We received our toys for free for the purpose of this review but that does not effect our thoughts. 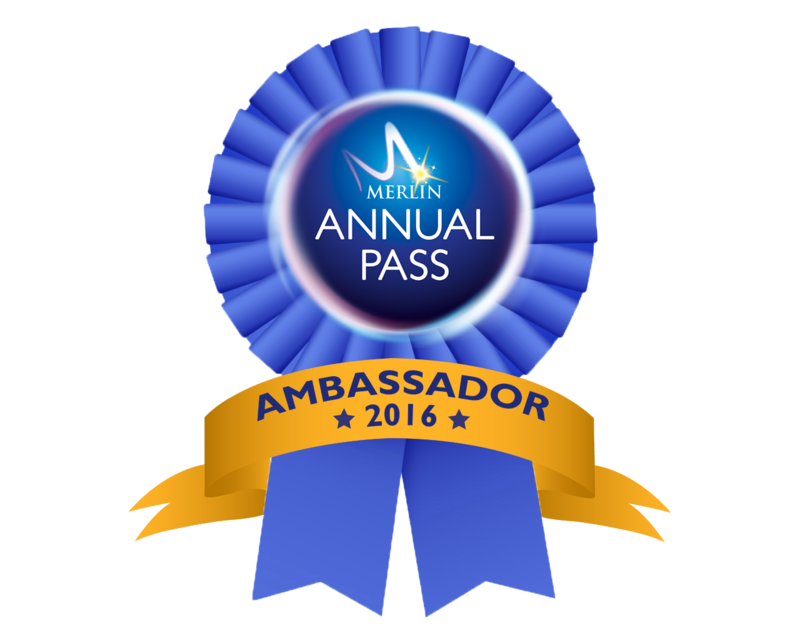 All views and opinions expressed are 100& honest and my own.